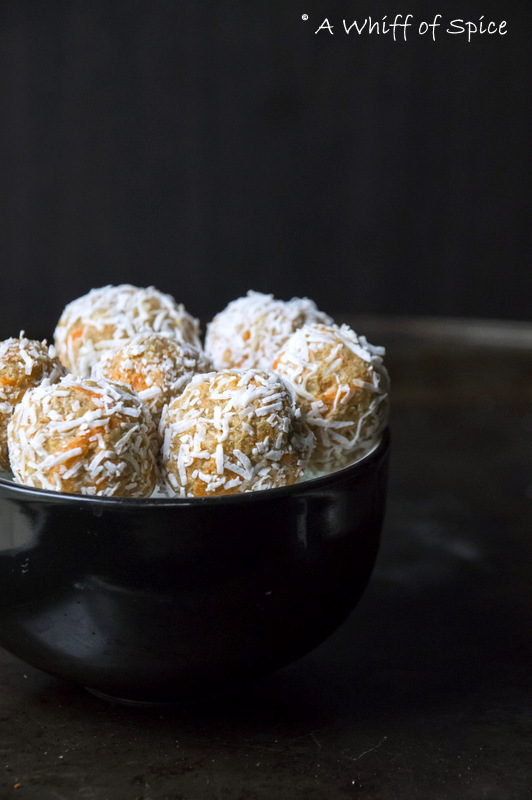 I know I have been saying this a lot lately, but honestly, these Quinoa 'Carrot Cake' Bites are sooooooo good! I LOVE Carrot Cake and these bites tastes exactly like that. I made them on a whim. I was looking for a snack to take with us on our weekend trip to St. Louis. St. Louis is about 6 hours drive from Cincinnati and frequent snacking is the only way, I can keep the "Are we there yet!" syndrome at bay. These bite sized balls of yum, fits the bill perfectly. Carrots, Cinnamon and Walnuts - all my favorite Carrot Cake ingredient packed into one powerful bite! I also added a little Ginger, as it really amps up the carrot's flavor. And since the Allspice was just next to the Ginger, I added some of that for good measure. You don't have to, but the warm spices does makes it extra special. Naturally sweetened with Date puree and loaded with Omega-3 rich Walnuts and heart healthy Hemp Seeds; Beta Carotene dense Carrots and Protein rich Quinoa, these bite-sized snack is a nutrition power house. 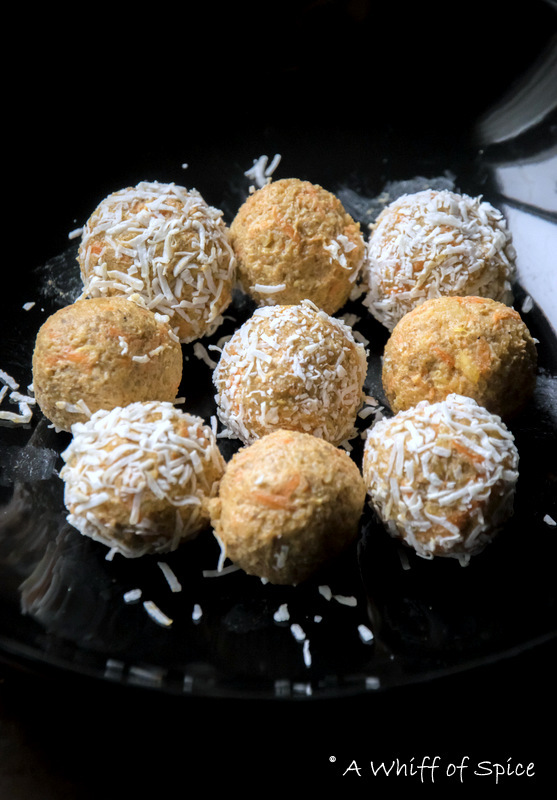 Just as an afterthought and to make them prettier, I rolled a few of the Quinoa 'Carrot Cake' Bites in unsweetened shredded coconut. And that took the flavor to another level. I'm so glad I did that. Rolling in shredded coconut is an optional step, but highly recommended. Thinking that Sid might not appreciate the coconut flavor, I kept few of the bites, plain. But surprisingly he loved the Coconut crusted one so much, that I had to roll the plain ones too! Give this recipe a try. You won't be disappointed! 1. To cook the quinoa, bring a saucepan of salted water to a boil. Add the quinoa and cook till soft. 4 to 5 minutes. Drain and keep aside. 2. Line a baking tray with parchment and keep aside. Pour the unsweetened shredded Coconut Flakes on a shallow plate. 3. Next, we need to make the 'glue' that will hold these bites together. In a food processor, add 1/4 cup of chopped walnuts, a teaspoon of milk and dates and pulse till resembles a coarse, sticky paste. Dump it in a large bowl. 2. Add the cooked and cooled Quinoa, grated Carrots, Cinnamon Powder, Allspice powder (if using) and the Ground Ginger (if using). Fold everything in gently. The consistency should be like a sticky dough. 3. Line a baking tray with parchment. 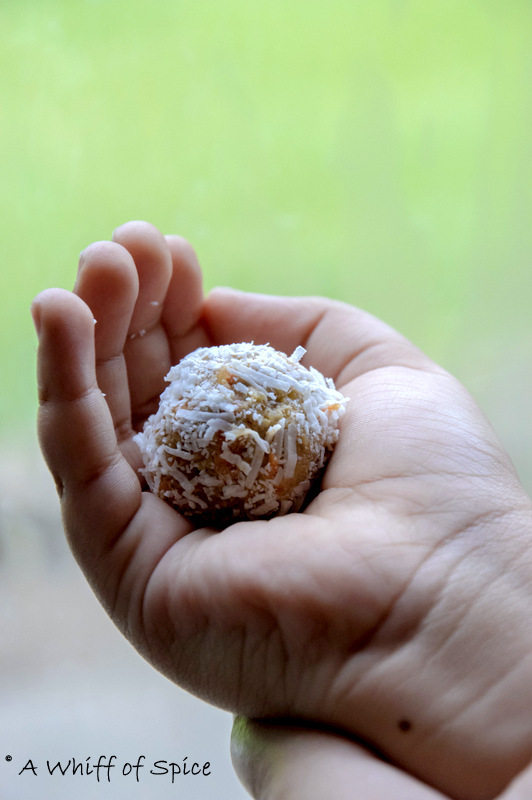 Using a small cookie scoop or a tablespoon measure, scoop out the dough and shape into balls using your palms. 4. Roll them in shredded coconut and place them on the parchment lined baking sheet. Refrigerate for about 30 minutes to harden a bit. 5. Enjoy cold and store the leftovers in a the refrigerator in an airtight container. Should keep fresh for a week. Note/Tip: In a warm or humid environment, these bites might get a bit sticky. While travelling, I prefer caring them in a insulated bag with a ice pack in it.